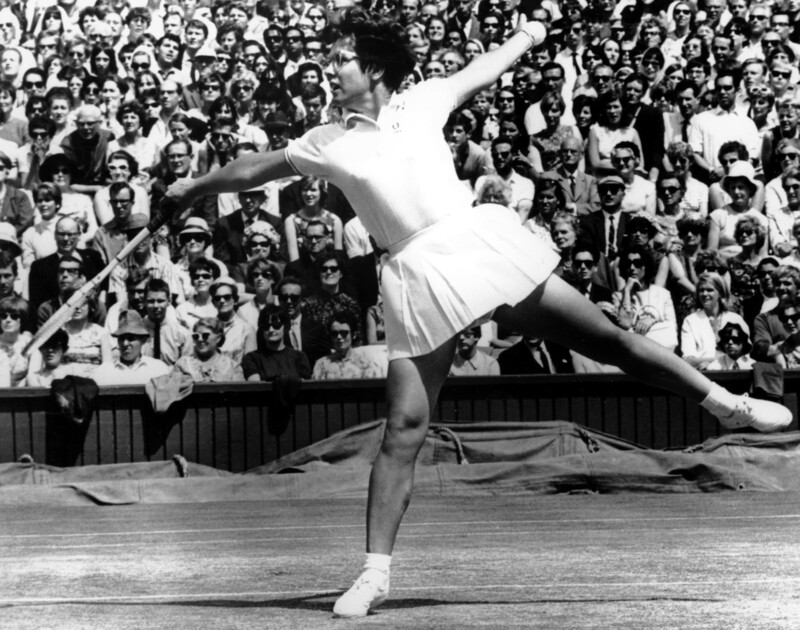 Billie Jean King was born November 22nd 1943 in Long Beach California, the eldest child of Bill and Betty Moffitt. Raised in a conservative Methodist family, Billie Jean was very religious as a child and originally expressed desires to become a preacher. Billie Jean’s mother was predominantly a homemaker, but took part time jobs selling Tupperware and Avon while her father was an engineer for the local fire department. Billie Jean was athletically inclined from an early age; both her and her brother were encouraged by their parents to participate in sports. Her father had played basketball against Jackie Robinson while in junior College and once turned down an invitation to try out for the NBA due to family commitments; Billie Jean was just a year old at the time. Her younger brother Randy also shared their father’s love of sports, and went on to become a Major League Baseball pitcher for 13 years. Originally a devotee of softball, Billie Jean was introduced to tennis by school-friend Susan Williams, who took her along to a country club where Billie Jean played for the first time. During the 1950s and 1960s, tennis was still perceived as a country club sport, and therefore not something that was readily available to working class children such as Billie Jean. Upon discovering that there was free instruction available at the public courts in Houghton Park, Long Beach, she fell in love with the sport, and was soon buying her first racquet with the money saved from doing odd jobs for her parents and neighbors. By the time she was 14, she had won her first championship in Southern California, and soon went on to be coached by 1930s tennis champion Alice Marble at 15. The product of a working class family, she found herself caught up in a privileged country club sport and soon began to ask herself questions; it was a pivotal period of awakening for Billie Jean that would later prove to be a driving force in her career. While her tennis career grew, she attended Los Angeles State College for three years and there she met future husband Larry King, whom she married in 1965. It was here that Billie Jean’s eyes began to open up to the inequalities faced by women in society. As a talented amateur tennis player, she was denied access to a college scholarship simply because she was female. Her first success came in 1961 while still at college when she won the Wimbledon doubles championship with partner Karen Hantze on her first attempt, becoming the youngest team to win and bringing her great acclaim. 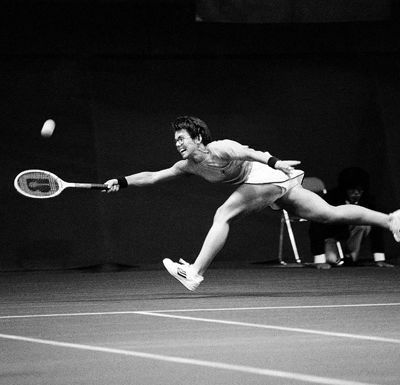 During the 1960s, Billie Jean went on to dominate women’s tennis, playing with a demeanor on court that was a fresh departure from that of the demure female tennis players that had preceded her. In 1966, she won her first Wimbledon singles title, coming back again in 1967 to repeat her success. Between 1966 and 1974, Billie Jean was ranked number one in the world five times, and was in the top ten for a total of 17 years. She is the winner of 39 Grand Slam titles (12 singles, 16 doubles, 11 mixed), bringing her to third on the all-time list of female tennis stars. She enjoyed her greatest success at Wimbledon, where she holds a record 20 titles. She is one of three players to accomplish a Grand Slam Triple crown at Wimbledon in the Open Era of tennis, Margaret Court and Martina Navratilova being the others. In 1971, she became the first female athlete to win more than $100,000 in one season. In addition to her incredible record, Billie Jean is also recognized for her struggle for gender equality both on and off the court. She was one of the greatest proponents of equal pay within tennis, as well as a great critic of the US tennis authorities promotion of “shamateurism” in the pre-open era. In September 1970 she was one of nine players who broke away from the tennis establishment and signed $1 contracts with tennis promoter Gladys Heldman in Houston. The players’ revolt and subsequent tournament led to the formation of Virginia Slims Tour, which Billie Jean had a fundamental role in forming, helping to obtain financial backing from commercial sponsors and promoting the tour. It was the birth of women’s professional tennis. Following the formation of tour, Billie Jean began to notice the huge disparity in prize money between the men and the women, at some tournaments as much as a twelve to one ratio. She began to openly criticize the low prize money on offer, noting that women were receiving far less than men for what she considered equal ability and effort. She pushed relentlessly for equal prize money, better rights and recognition for female tennis players and eventually her constant lobbying paid off when in 1973, the US Open awarded equal prize money to both men and women. The US Open was the first of the four major tournaments to award equal prize money and it took another 34 years until all four major tournaments were paying all men and women equally. The 1970s was a period of cultural ferment; the Watergate scandal was heating up, Vietnam was cooling down and the women’s liberation movement was at its height. Billie Jean’s prominence in the fight for equal pay made her a natural spokesperson for the movement. She was a key figure in the foundation of the Women’s Tennis Association and outside of tennis helped lobby for the groundbreaking legislation Title IX to be passed through congress, which succeeded on June 23 1972. It would require all colleges receiving federal funds for education to spend the money equally on boys and girls. Her role as leader in feminist cause peaked in 1973, when she faced aging ex-tennis star Bobby Riggs in a tennis match, dubbed “The Battle of the Sexes”. Played at the Houston Astrodome on September 20th 1973, the carnival atmosphere of the match drew considerable publicity and was televised before a worldwide audience of some 50 million, with 30,000 present in the Astrodome, for the largest ever tennis audience, a record still held to this day. It was more than just a tennis match; it was a cultural phenomenon. Billie Jean went on to beat the self-described male chauvinist in a five set match 6-4, 6-3, 6-3, empowering women and educating men in one fell swoop. It was a great leap forward for women’s tennis. Presented as a battle of the sexes, it was a great symbolic victory for women and proved to be a pivotal moment in gender relations for generations of Americans. In 1973, Billie Jean was named Sports Illustrated ‘Sports Person of the Year’, the first woman to be honored as such. In 1974, she created the Women’s Sports Foundation, which aimed to provide opportunities for female participation in sport. 1974 also saw the creation of World Team Tennis, a professional co-ed tennis league, which saw Billie Jean coach the Philadelphia Freedoms and become the first woman to coach professional male athletes. In 1987, she was elected to the International Tennis Hall of Fame, cementing her place as one of history’s tennis greats. She remained active in tennis after her retirement; she captained the United States Fed Cup team from 1995 until 1996 and again from 1998 until 2001, as well as the US Olympic Women’s tennis teams in 1996 and 2000. She has spent much of her later years devoted to helping younger tennis players access the sport, and continues to work on the foundations put in place by the passage of Title IX. In 2006, The United States Tennis Association honored Billie Jean when they renamed the National Tennis Center, home of the US Open, the Billie Jean King National Tennis Center. In 2009, Billie Jean was awarded the Presidential Medal of Freedom, the highest civilian honor in American society. She is a continuing supporter of LGBT rights in America and also serves on the board of long-time friend Elton John’s charity, the Elton John AIDS foundation. Billie Jean is always looking for new ways to continue her work with the younger generation and has in recent years work closely with the First Lady Michelle Obama on her ‘Let’s Move’ campaign, an initiative with the aim of eradicating childhood obesity in one generation. She is also a member of the President’s Council on Fitness, Sports and Nutrition, which helps to engage, educate and empower Americans to adopt a healthy lifestyle. As one of the most illustrious and celebrated tennis players in history, Billie Jean King can be described as a visionary and innovator, as well as champion.